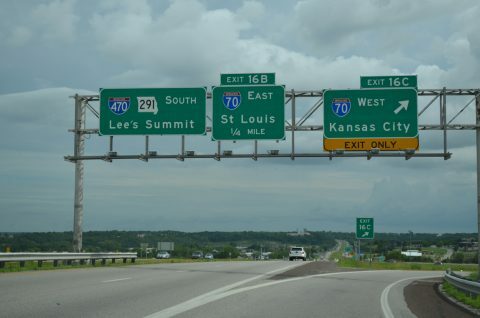 Interstate 470 in Missouri connects southern Kansas City with Independence, providing a bypass of the Kansas City metropolitan area to the southeast and a commuter route to Lee’s Summit. 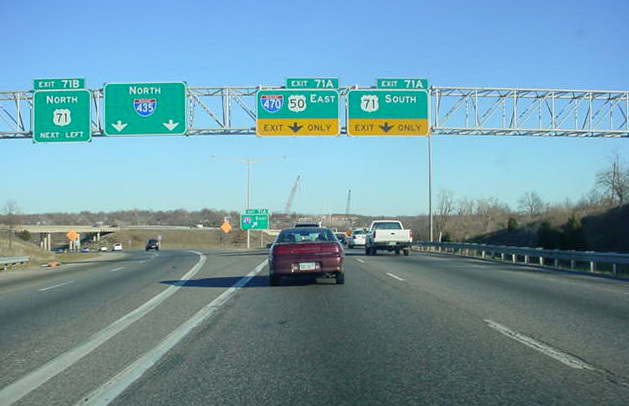 The freeway overlaps with U.S. 50 from the Three Trails Crossing Memorial Highway interchange with I-49 and I-435 to Exits 7A/B, and doubles as Missouri 291 on its north-south section between Exits 10 and 16. 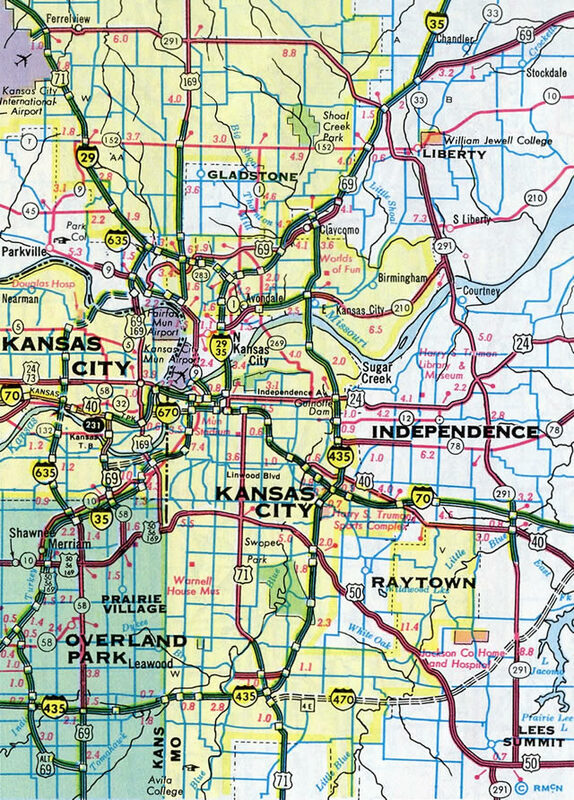 Old U.S. 50 is designated Missouri 350 between Interstate 470 and Interstate 435 through Raytown and Kansas City. 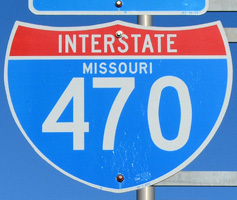 The alignment of Intestate 470 appeared on the Missouri Official Highway Map by 1964 from the Grandview Triangle Interchange with U.S. 71 and I-435 east to then-Bypass U.S. 71 north of Lee’s Summit. 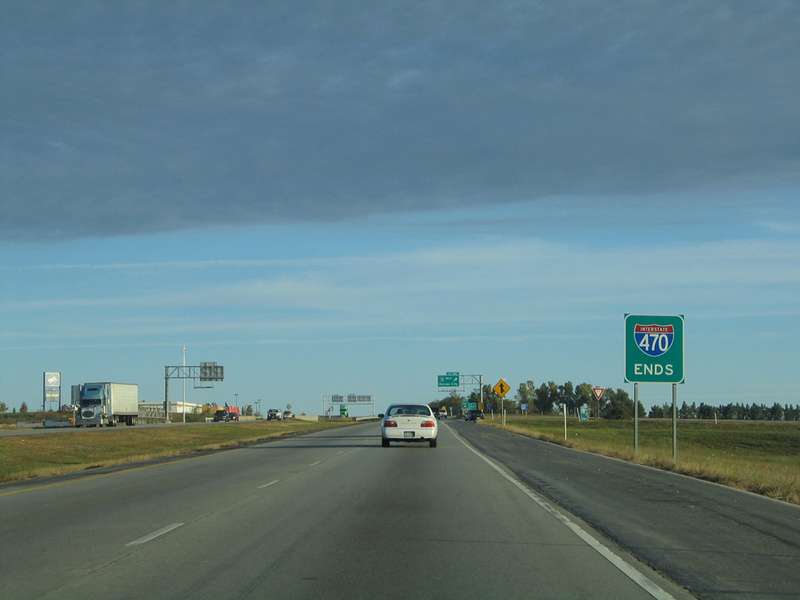 U.S. 71 Bypass ran north from U.S. 50 to U.S. 40 as part of the planned route. Missouri 291 replaced U.S. 71 Bypass by 1975, with a short stretch of expressway completed by 1969 from south of U.S. 40 to 39th Street. 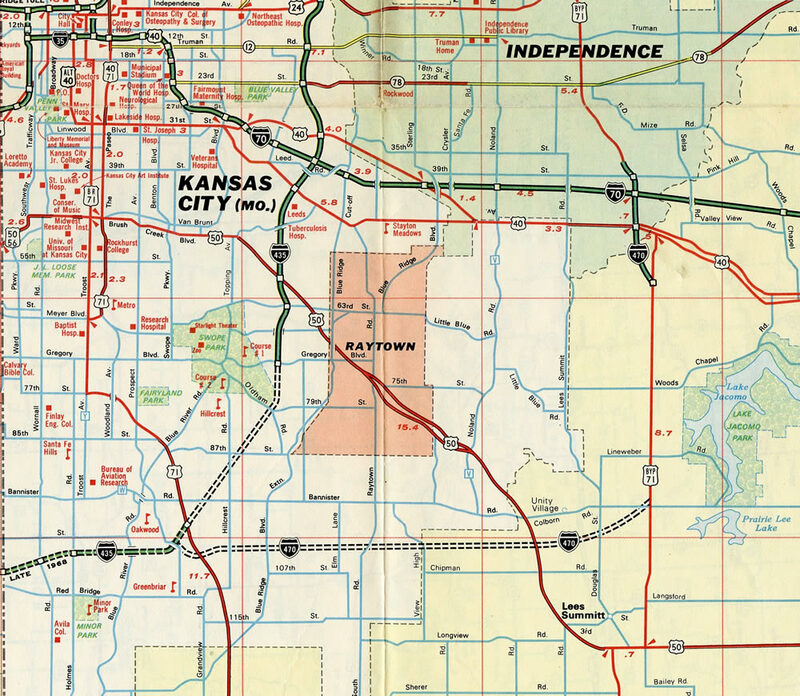 The 1983-84 Missouri Official Highway Map shows the Interstate fully opened to traffic. The Grandview Triangle Interchange, where I-435, I-470 and U.S. 71 came together in south Kansas City, was redesigned during an eight year project completed in May 2008. The original junction was chronically congested, having been designed when the area was vastly more rural. 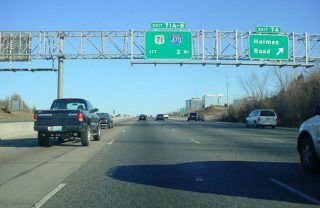 Suburban growth both along I-435 and U.S. 71 overran the exchange with commuter traffic, leading to the need for the $300 million upgrade. 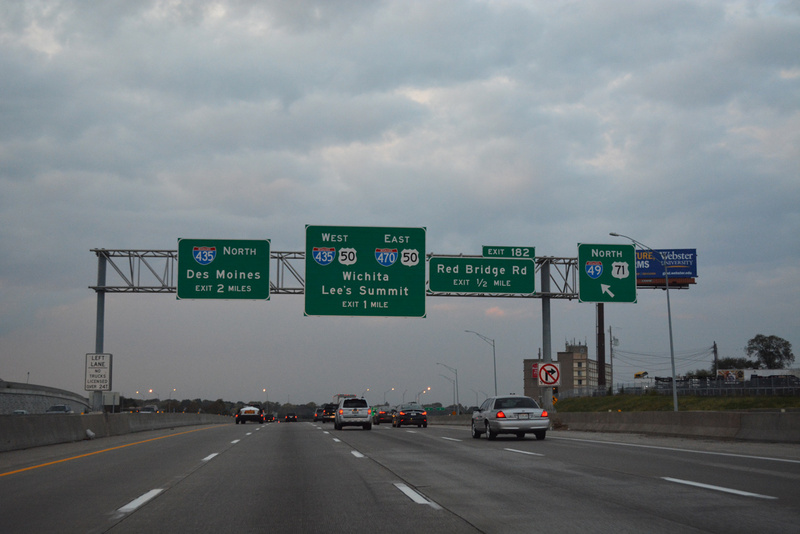 Construction removed some of the left-hand ramps and expanded the freeway mainlines among other improvements. 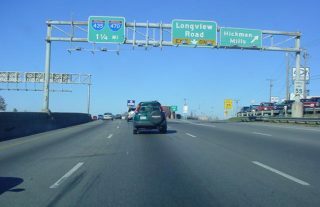 The junction was renamed the Three Trails Crossing Memorial Highway to reflect the end of the Grandview Triangle Interchange era. 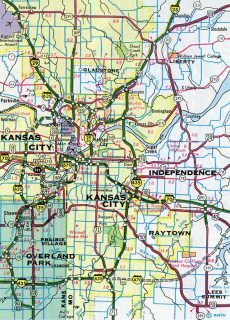 The 1981 Rand McNally North American Road Atlas showed Interstate 470 open from the Grandview Triangle east to Missouri 350 at Lee’s Summit. 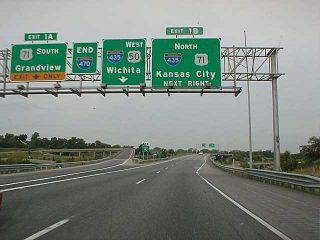 U.S. 50 was relocated onto Interstates 470 and 435, bypassing Kansas City, when the east-west section of I-470 opened. 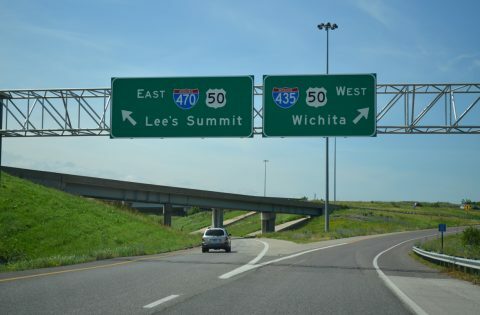 U.S. 50 previously followed Blue Parkway northwest to Swope Parkway, where it combined with U.S. 56 west to Interstate 35 at Merriam, Kansas. A short stretch of freeway was open at Independence for U.S. 71 Bypass by 1968. 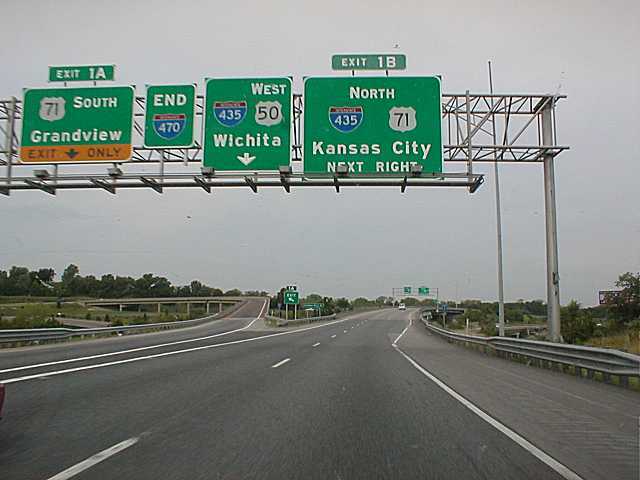 This was incorporated as the north end of I-470. 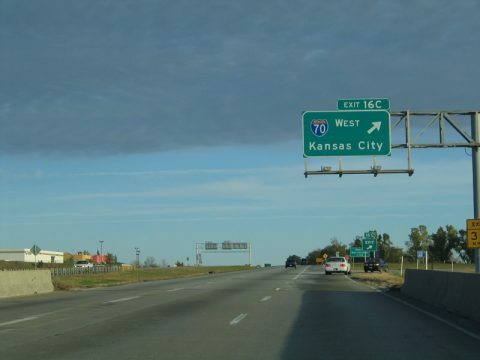 U.S. 71 Bypass provided a surface route bypass of the Kansas City area. 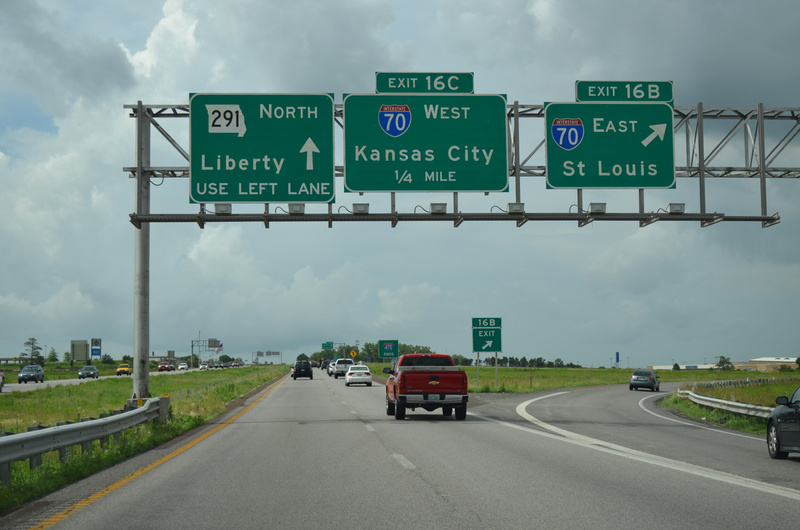 The designation was renumbered as Missouri 291 by 1972. 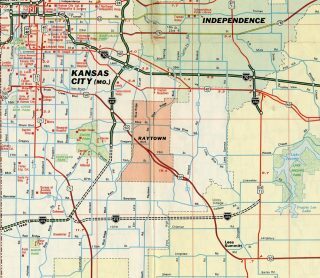 It ran from Harrisonville north to Lee’s Summit, Liberty, Nashua and U.S. 71, six miles southeast of Platte City. Interstate 470 first appeared on the Rand McNally North American Road Atlas in 1976. 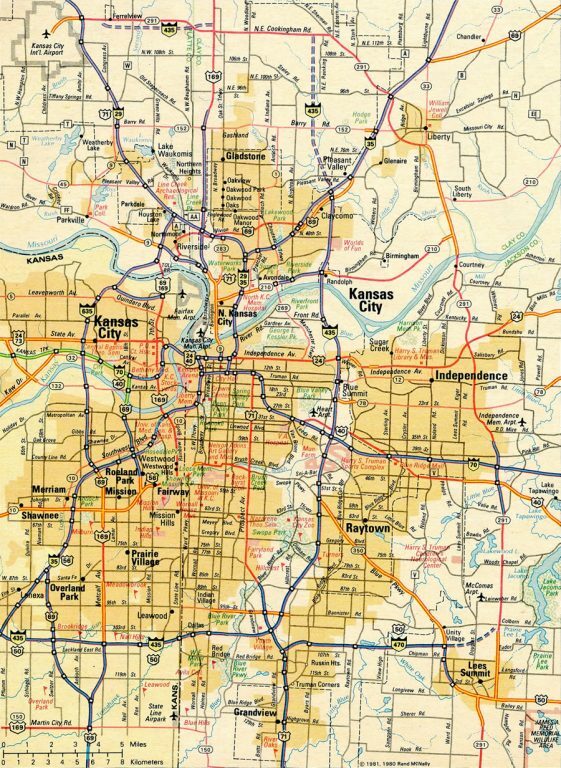 1960s and 1970s era maps showed Interstate 470 proposed in a more northeasterly alignment than what was ultimately constructed over Missouri 291. 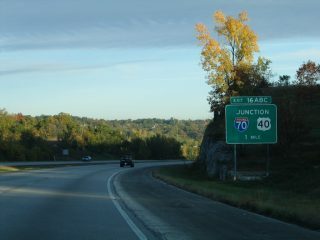 I-470 & Missouri 291 lower through a rock cut toward the Little Blue River beyond the first sign for U.S. 40 and Interstate 70 in Independence. Photo taken 06/18/15. 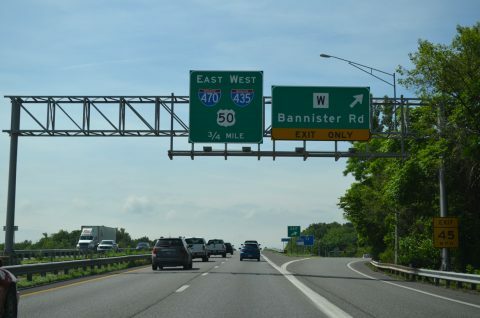 Interstate 470 ends a half mile north of the diamond interchange (Exit 16) with U.S. 40. 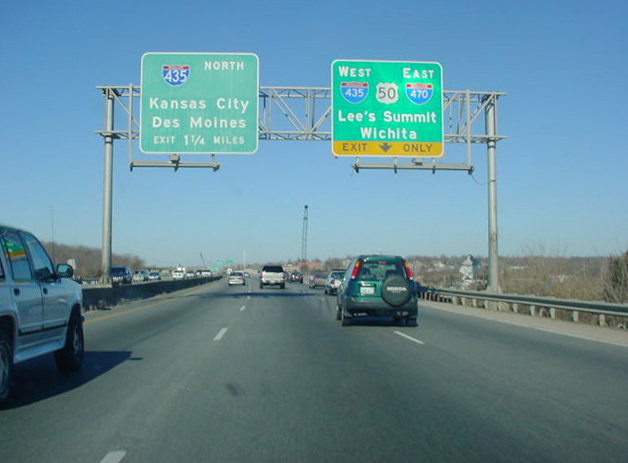 Like U.S. 69 with I-35, U.S. 40 intertwines or overlaps with I-70 in stages through the Kansas City area. 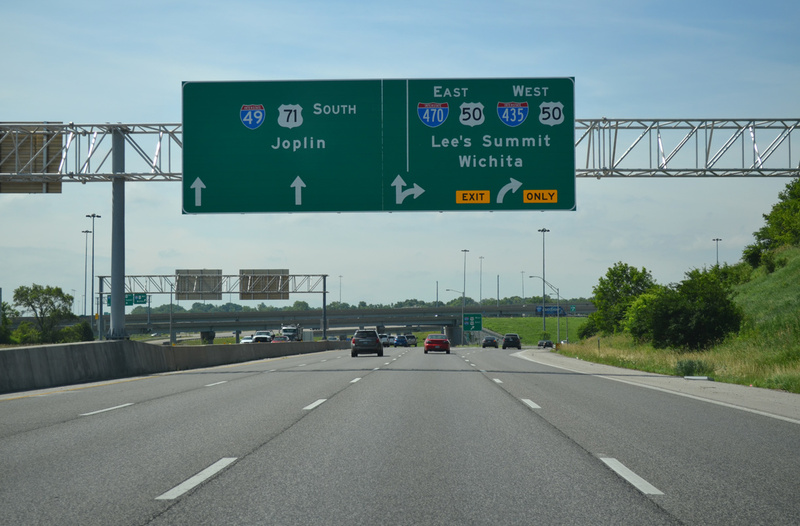 Missouri 291 extends north from the I-470 terminus as a short freeway to 39th Street. Photo taken 10/17/04. Interstate 470 & Missouri 291 northbound reach Exit 16B for Interstate 70 east. St. Louis is a 227-mile drive across the Show-Me State. Photo taken 06/18/15. 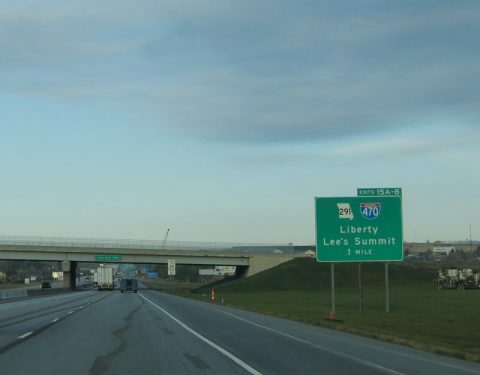 An end sign for Interstate 470 stands between the I-70 off-ramps within the cloverleaf interchange. 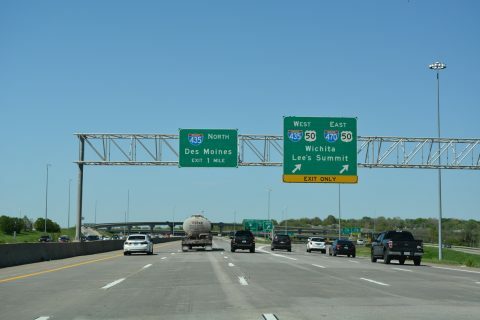 Traffic continuing northward along Missouri 291 transitions to an at-grade, divided highway to Liberty and I-35 to the north of the Missouri River. Photo taken 06/18/05. Interstate 70 enters the city limits of Kansas City in five miles and reaches Downtown Kansas City in 14 miles. Photo taken 10/17/04. 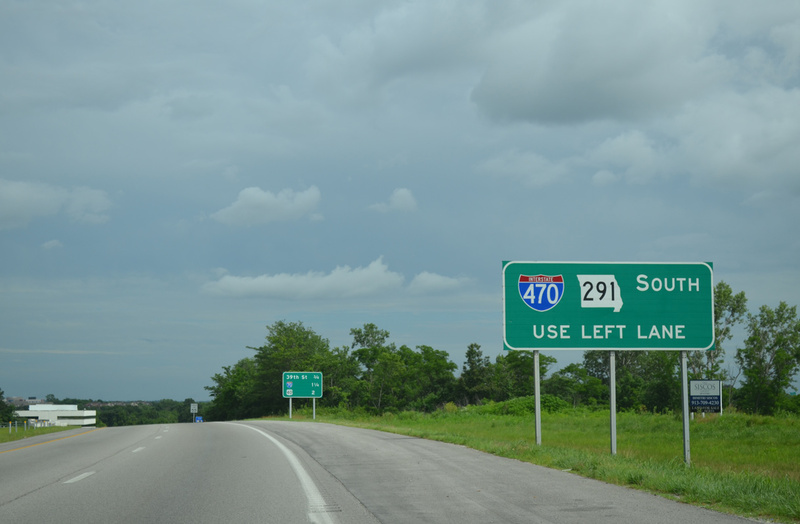 MO 291 heads southeast from a commercialized stretch at MO 78 to become an expressway leading to Interstates 70 and 470. Photo taken 06/18/15. 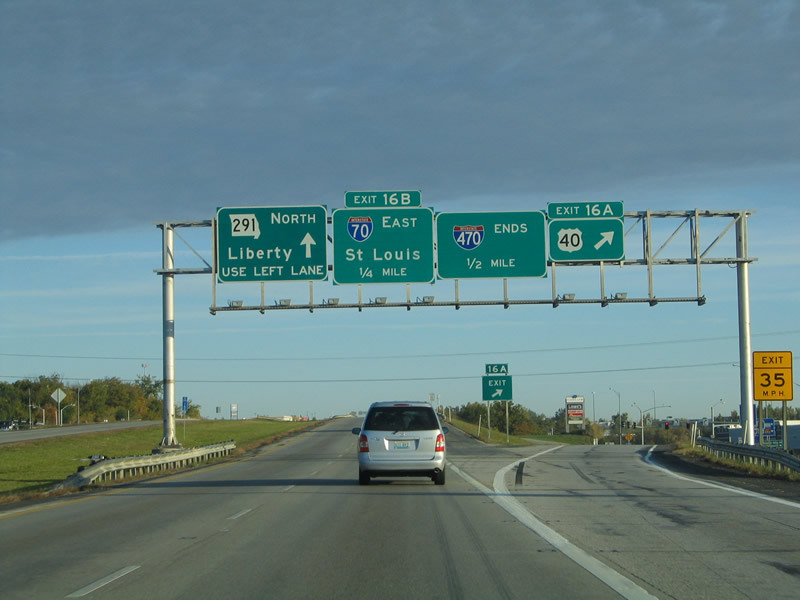 Interstate 470 begins as MO 291 crosses over Interstate 70 at their full cloverleaf interchange. Photo taken 06/18/15. 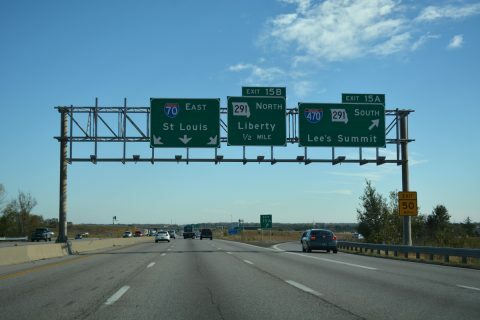 Exit 16B loops away from I-470 & MO 291 south for Interstate 70 east to Columbia and St. Louis. Photo taken 10/17/04. 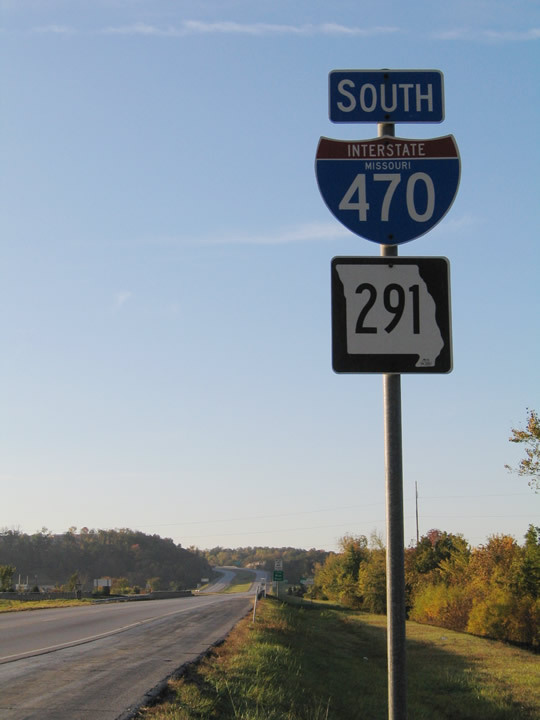 Interstate 470 and MO 291 are cosigned along the north-south section of the freeway. This is the first shield assembly on southbound. Photo taken 10/17/04. Interstate 70 west straddles the Blue Springs and Independence city line to the Little Blue River preceding Exit 17. Upcoming I-470 & MO 291 south meet U.S. 40 in Independence before crossing into Lee’s Summit. Photo taken 10/17/04. 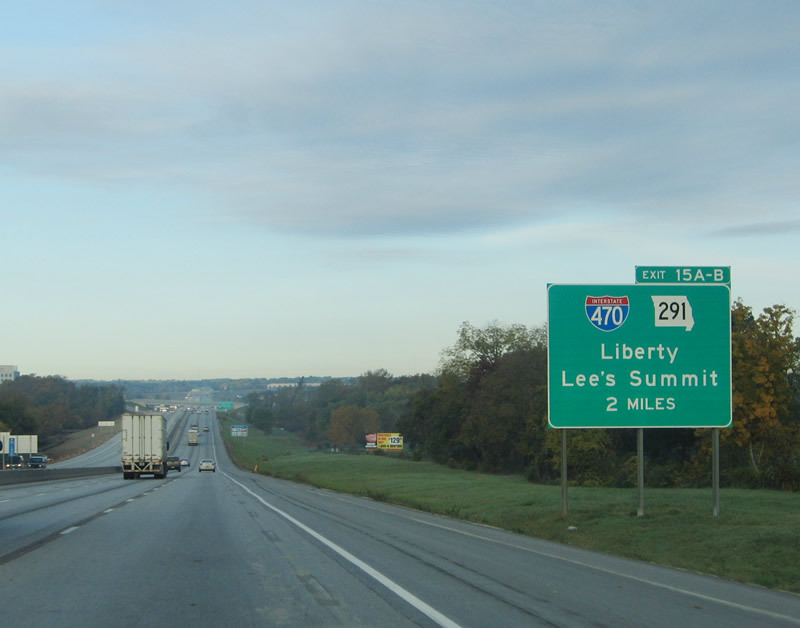 One mile ahead of Exit 15 with Interstate 470 south and MO 291 on I-70 westbound. MO 291 replaced the U.S. 71 Bypass designation from Nashua and Liberty south to Lee’s Summit and Harrisonville. 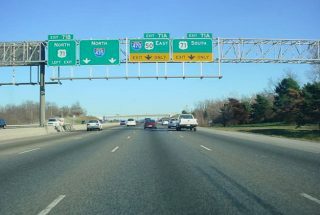 I-470 was built directly over a portion of the state highway. Photo taken 10/17/04. Missouri 291 extends north as a freeway to adjacent 39th Street by Independence Center mall. 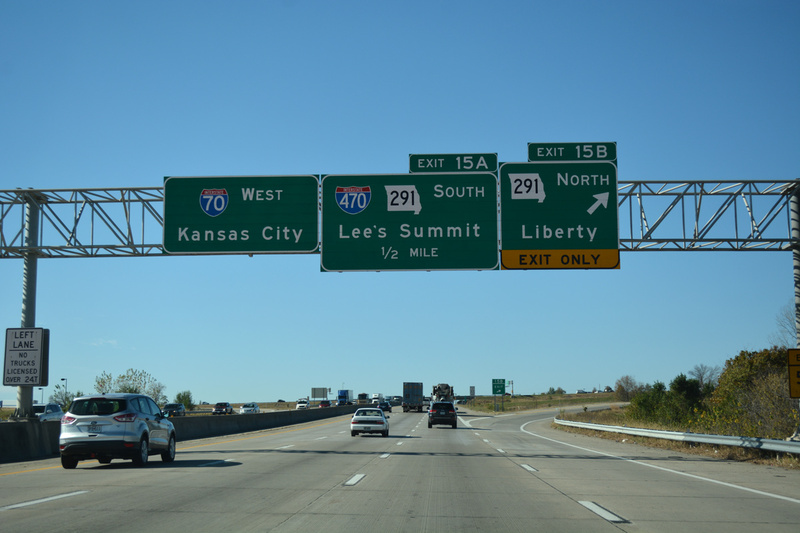 South from Exit 15A, MO 291 and I-470 overlap for 6.62 miles. Photo taken 11/03/16. 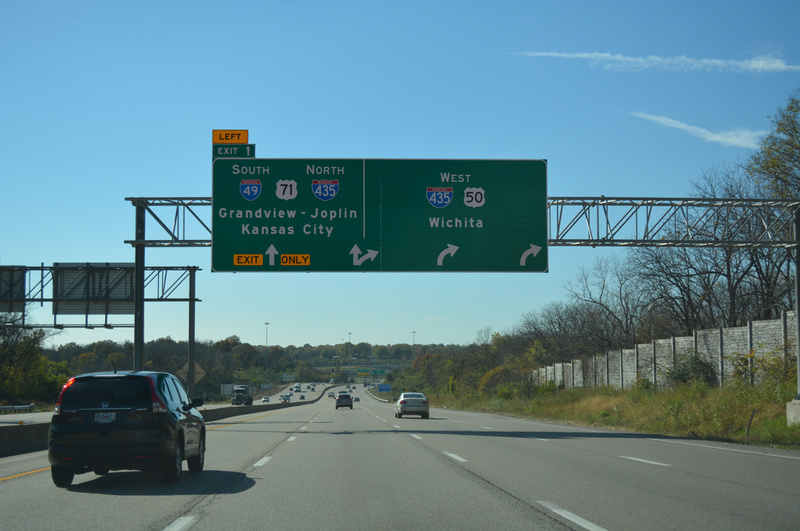 The suburban loop of Interstate 470 leads motorists southwest to I-49 & U.S. 71 near Grandview and I-435 west to Johnson County, Kansas. Photo taken 10/17/04. 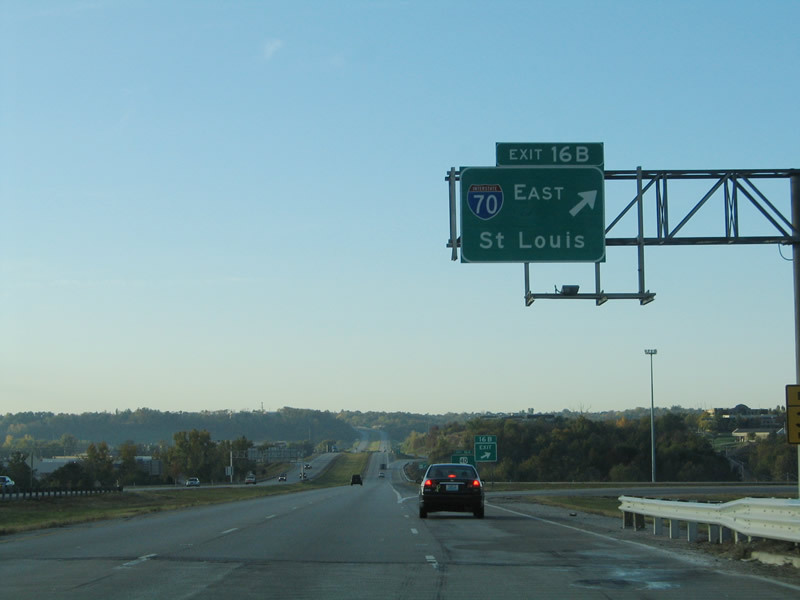 Interstate 70 runs between several subdivisions to the commercialized junction with Interstate 470 and Missouri 291. Independence Center mall and array of shopping centers surround the upcoming exchange. Photo taken 11/03/16. Exit 15A leaves I-70 east for I-470 & Missouri 291 south to Fleming Park and Lee’s Summit. Photo taken 11/03/16. The first indication that Interstate 470 was about to end. This sign was replaced by 2008 to no longer display Junction. Photo taken 10/17/04. Replaced end sign for Interstate 470 north beyond the departure of Exit 16B to I-70 east. Photo taken 10/17/04. 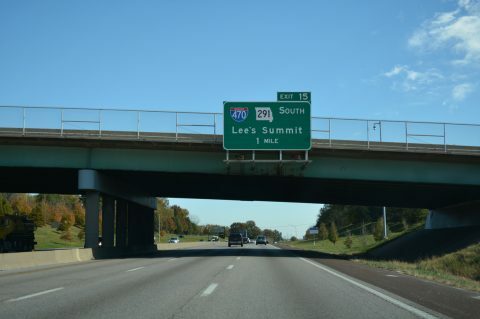 This sign bridge was replaced during an expansion project to add an auxiliary lane from the Little Blue Parkway on-ramp to the MO 291 north off-ramp. Photo taken 10/17/04. The initial signs for the Three Trails Crossing Memorial Highway interchange with Interstates 49 and 435 appears ahead of the Blue Ridge Boulevard off-ramp for the Fairlane and Hickman Mills South communities on I-470 & U.S. 50 west. Photo taken 11/03/16. 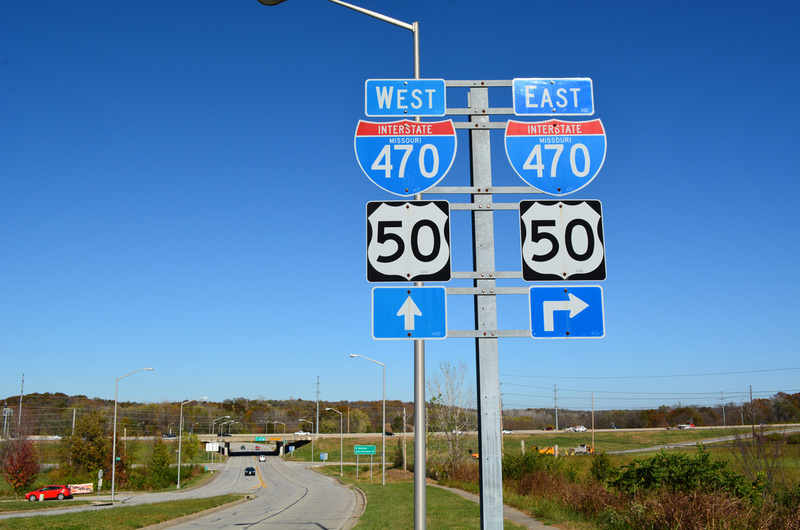 I-470 & U.S. 50 proceed west with three lanes to the directional T interchange with I-49 south & U.S. 71 (Exit 1). Photo taken 11/03/16. An arrow per lane sign (APL) directs motorists to the left for Interstate 49 & U.S. 71 south to Grandview and Joplin and the Kansas City beltway north toward Independence and Claycomo. Photo taken 11/03/16. 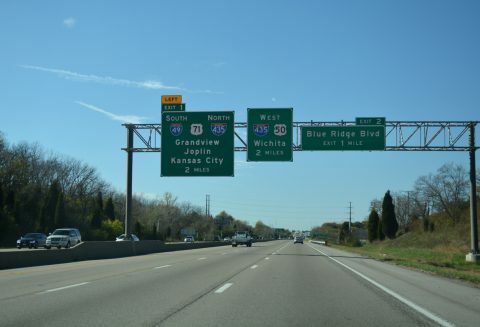 Interstate 49 & U.S. 71 cross the Kansas City line beyond the forthcoming overpasses for Blue Ridge Boulevard and the KCS Railroad. Back to back ramps follow for Red Bridge Road (Exit 182) and the Three Trails Crossing Memorial Highway interchange with I-435, I-470 and U.S. 50. Photo taken 11/02/16. 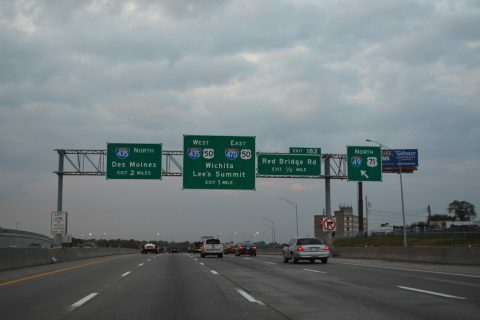 Traffic joins I-49 & U.S. 71 north from Blue Ridge Boulevard ahead of the diamond interchange (Exit 182) with Red Bridge Road at the Hickman Mills community of south Kansas City. Two lanes will part ways with the freeway north for a distributor roadway to I-470 & U.S. 50. Photo taken 11/02/16. 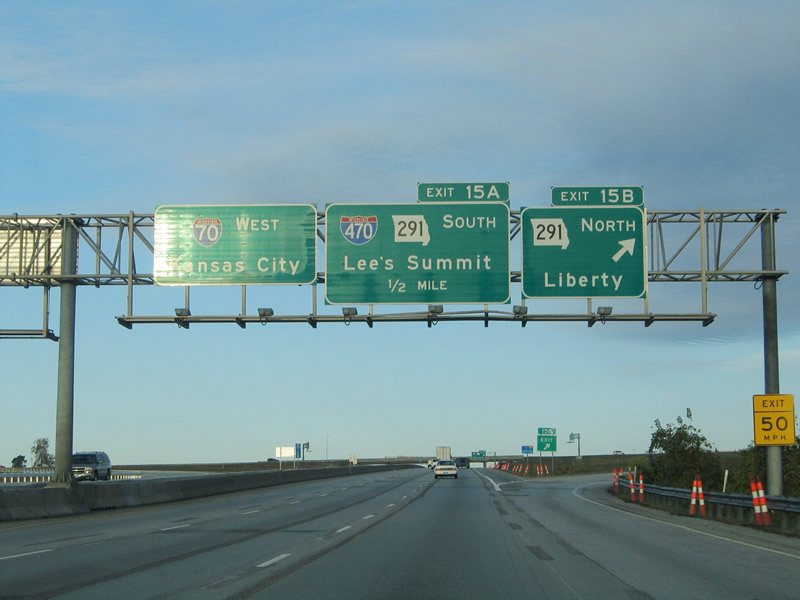 Interstate 470 branches east from the Kansas City beltway (I-435) with U.S. 50 to Longview in Kansas City, and Lee’s Summit. 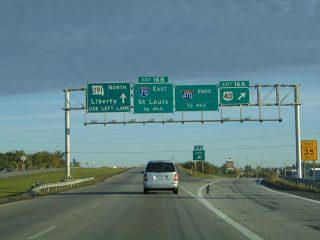 I-470 turns north beyond the split with U.S. 50 to overlap with MO 291 to Independence. Photo taken 11/02/16. 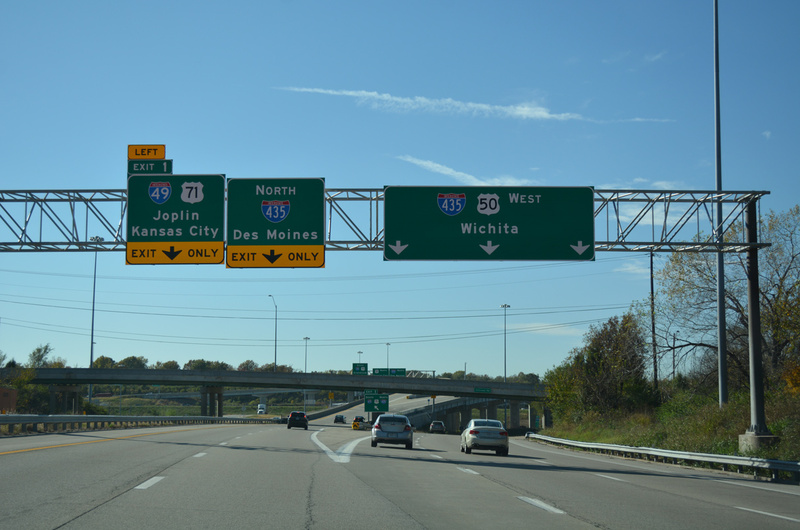 The Three Trails Crossing Memorial interchange upgrade separated traffic to I-470 east and I-435 west onto a distributor roadway. Motorists headed west to Overland Park and Lenexa, Kansas initially join I-470 before its merge with I-435 by the Oakwood area. Photo taken 11/02/16. 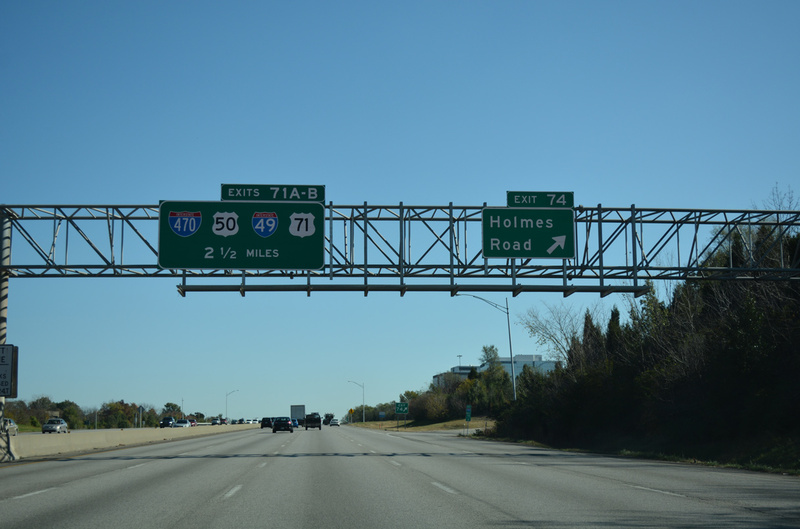 Interstate 435 & U.S. 50 travel east with four lanes through the six-ramp parclo interchange (Exit 74) with Holmes Road to cross the Blue River and reach the Three Trails Crossing Memorial Highway junction in 2.5 miles. Photo taken 11/03/16. 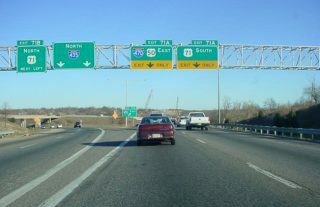 An auxiliary lane accompanies I-435 east to the eastbound beginning of Interstate 470. 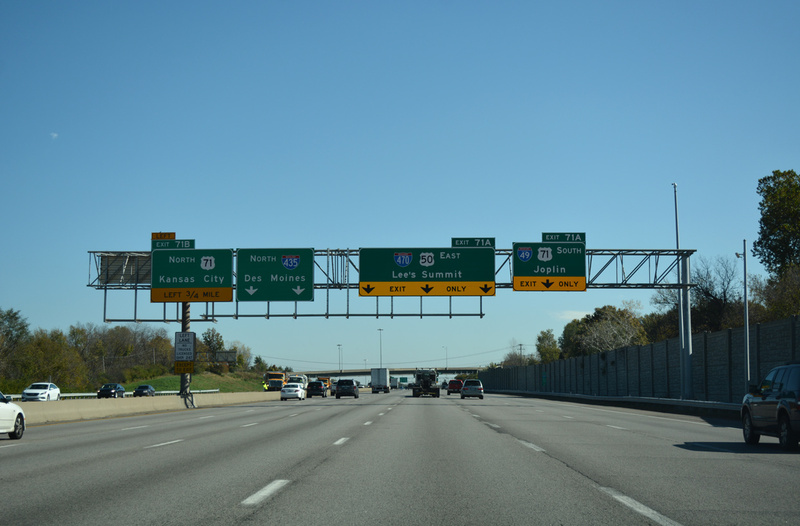 I-470 & U.S. 50 swing southeast from Exit 71A along side the beginning of Interstate 49 to provide part of the connection with the freeway south to Hickman Mills, Grandview and Belton. Photo taken 11/03/16. 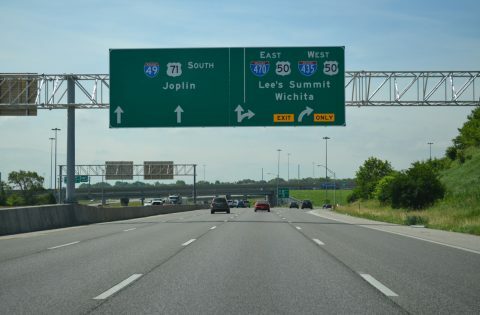 Expanding to six eastbound lanes, Interstate 435 sees a left-hand ramp (Exit 71B) for U.S. 71 (Bruce R. Watkins Drive) north to Blue Hills and Ivanhoe in Kansas City while four lanes depart for I-470 & U.S. 50 east to Lee’s Summit and I-49 & U.S. 71 south to Joplin. Photo taken 11/03/16. 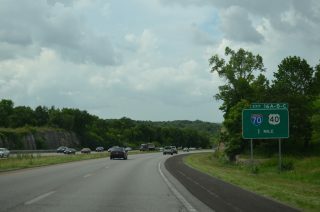 U.S. 71 (Bruce R. Watkins Drive) advances south to the Bannister Road exit for the Hidden Valley community on the 1.25 mile approach to ramps for I-435 & U.S. 50 east and I-470 & U.S. 50 west. Photo taken 06/19/15. 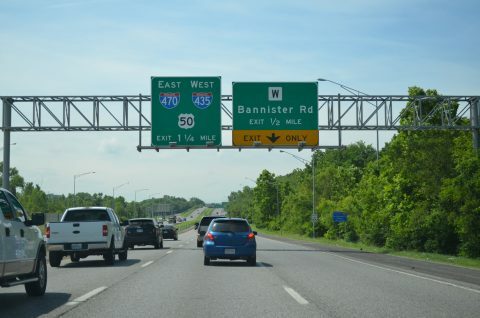 An unnumbered off-ramp departs for Highway W (Bannister Road) as U.S. 71 continues south with two through lanes to the Three Trails Crossing Memorial Highway. 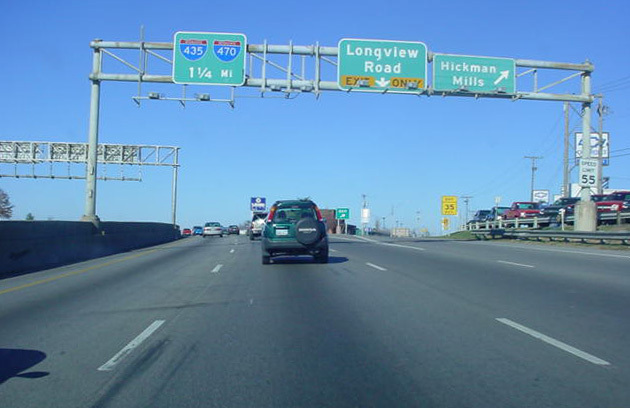 Advance signs omit control cities, a facet of the previous sign specifications. Photo taken 06/19/15. 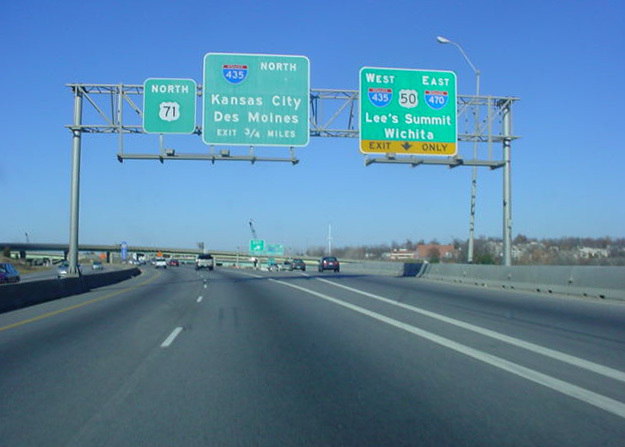 The ramps for I-435 west and I-470 east combine with ramps from I-435 south before joining their respective freeway mainlines. Lee’s Summit is an eight mile drive to the east. 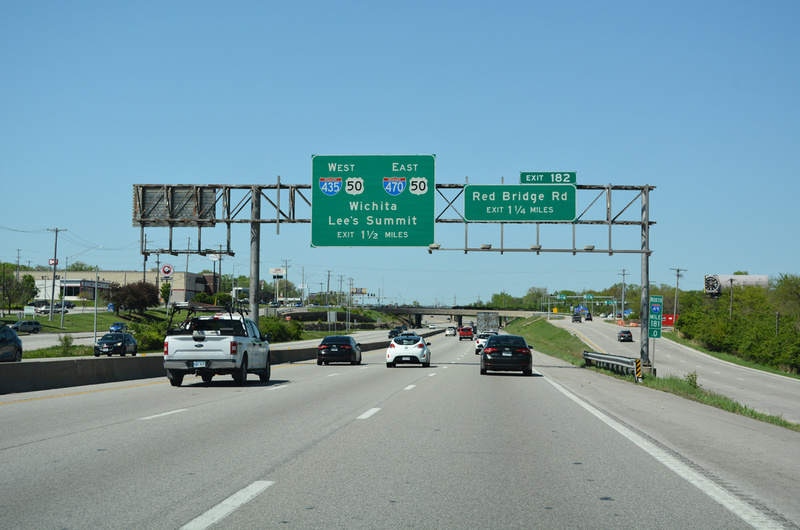 Wichita, Kansas lies 185 miles to the southwest via the Kansas Turnpike. Photo taken 06/19/15. An end sign was posted for Interstate 470 west at the original separation of traffic for U.S. 71 south (Exit 1A) and I-435 north / U.S. 71 north (Exit 1B). 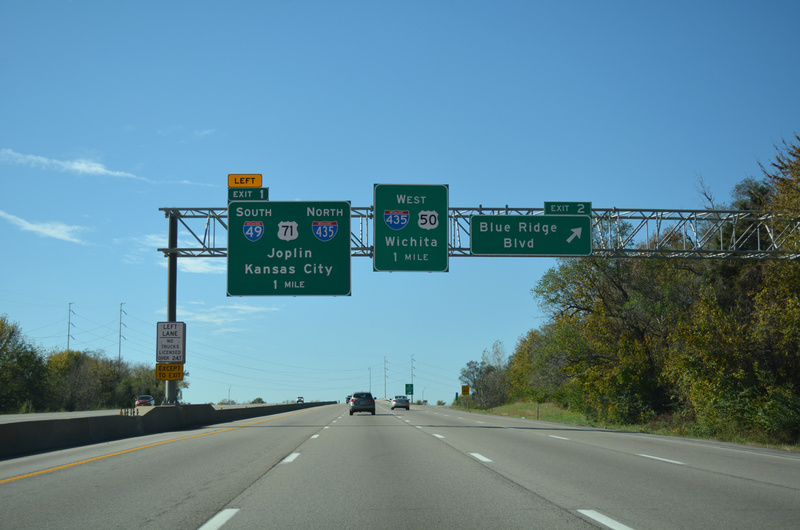 Exit 1 was reassigned to the left side ramp for I-49 & U.S. 71 south to Joplin. Photo taken by Ben Prusia (2002). 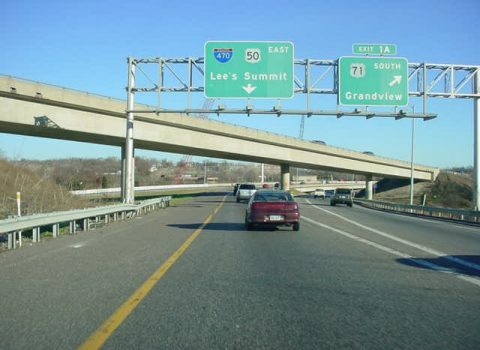 The rebuild of the Grandview Triangle Interchange expanded the U.S. 71 freeway mainline to eight overall lanes and reconfigured the interchanges with Blue Ridge Boulevard, Longview Road and Red Bridge Road to better separate ingress and egress traffic. 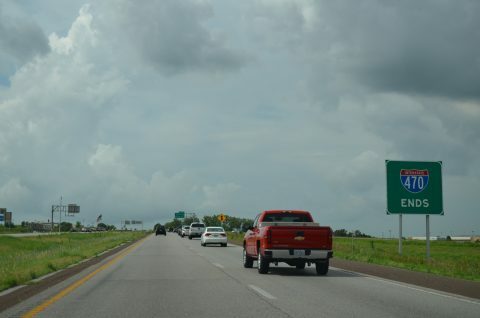 This view looks at the northbound freeway prior to roadwork. Photo taken by Eric Stuve (11/30/02). 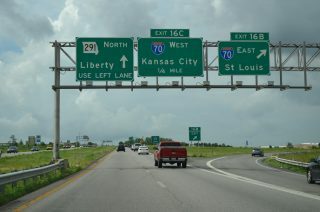 U.S. 71 continued north from Red Bridge Road with just three lanes to the off-ramp for I-435 west, I-470 east and U.S. 50. This stretch is five lanes wide now. Photo taken by Eric Stuve (11/30/02). 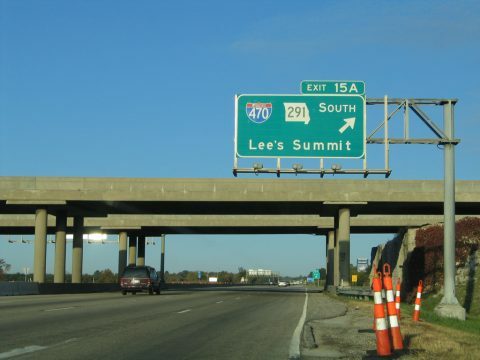 Northbound travelers reached the original Grandview Triangle Interchange with the Kansas City beltway and I-470 loop to Lee’s Summit. This interchange was notorious for congestion due to left side ramps and weaving traffic. Photo taken by Eric Stuve (11/30/02). The first sign for the eastbound I-435 split with I-470 & U.S. 50 appeared at the Holmes Road (Exit 74) off-ramp to the Linden Hills and Indian Heights communities. 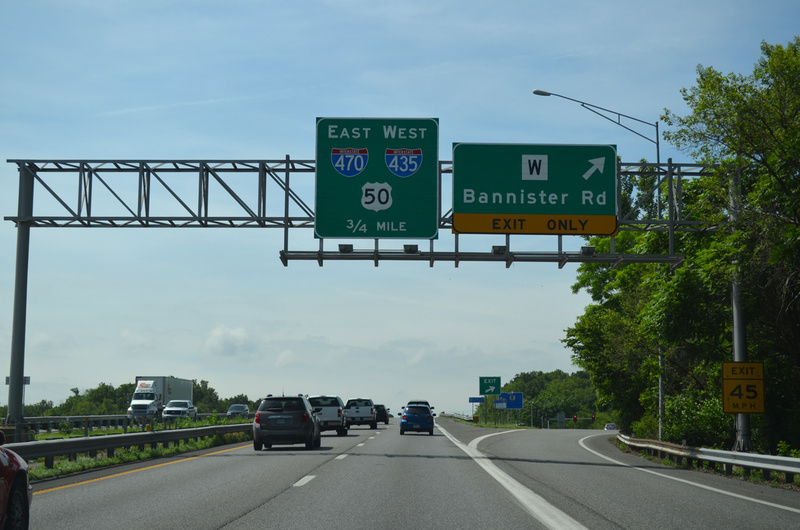 Signs were changed here, but the beltway otherwise remains the same today. Photo taken by Eric Stuve (11/30/02). Advancing toward the Grandview Triangle Interchange along Interstate 435 & U.S. 50 east. This stretch was expanded to six eastbound lanes. Photo taken by Eric Stuve (11/30/02). Nondescript signs directed motorists to U.S. 71 north (Exit 71B), I-470 & U.S. 50 east and U.S. 71 south (collectively Exit 71A) at the Grandview Triangle Interchange. 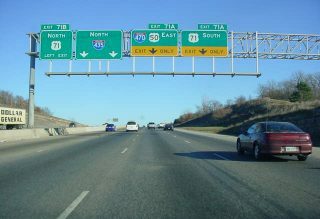 Replacements added control cities by 2007 as the interchange upgrade progressed. Photo taken by Eric Stuve (11/30/02). 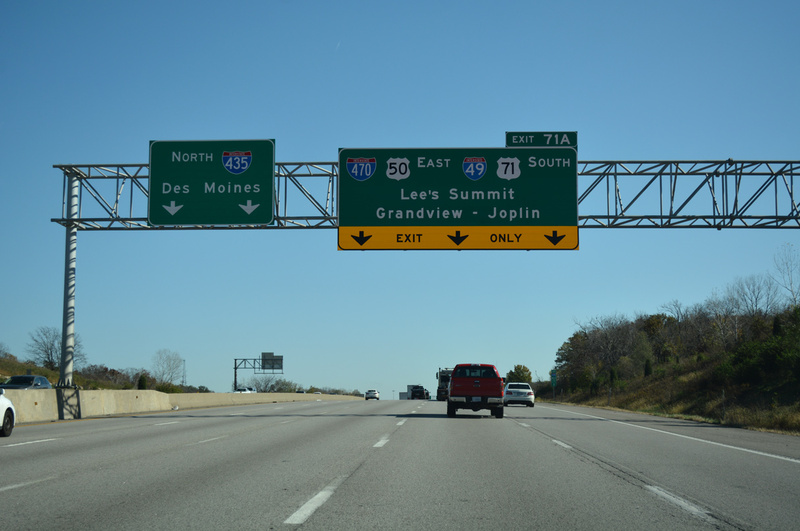 Interstate 435 began its northerly turn from the Grandview Triangle as two lanes departed for I-470 & U.S. 50 east. Exit 71A was reconfigured as I-470 east shifted to a roadway running along the outside of the Three Trails Crossing Memorial Highway interchange to a new high speed flyover above I-49 & U.S. 71. Photo taken by Eric Stuve (11/30/02). 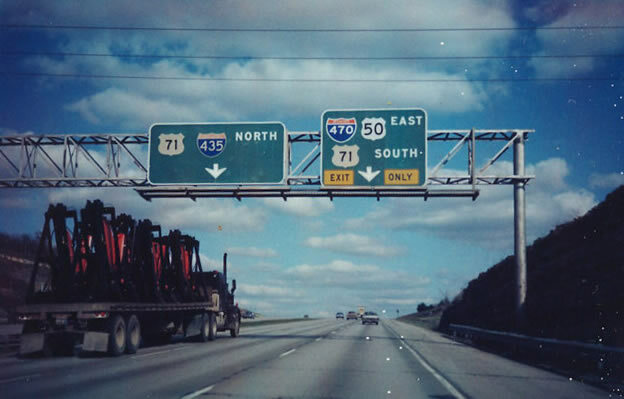 The former configuration of I-470 & U.S. 50 east at U.S. 71 south (old Exit 1A). 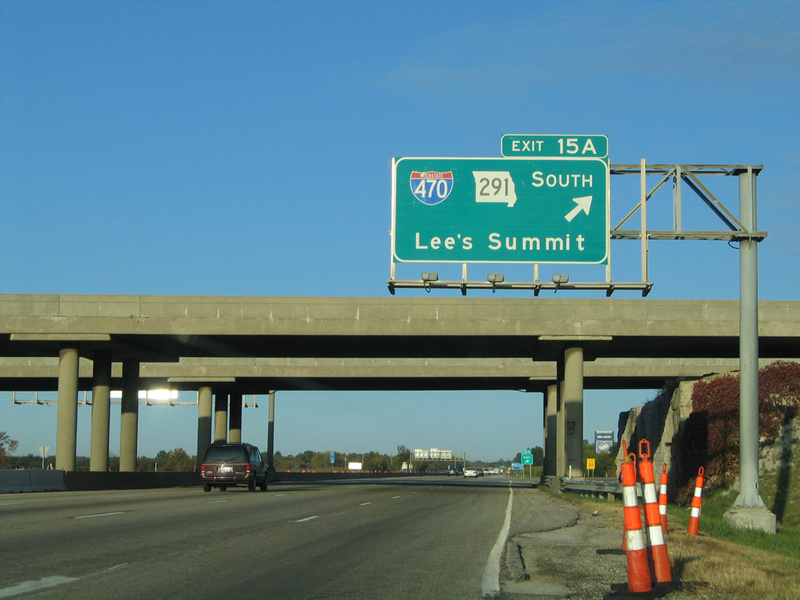 Three ramps now serve the freeway east to Lee’s Summit while two turn south for both I-49 & U.S. 71 south and the Red Bridge Road off-ramp. Photo taken by Eric Stuve (11/30/02). 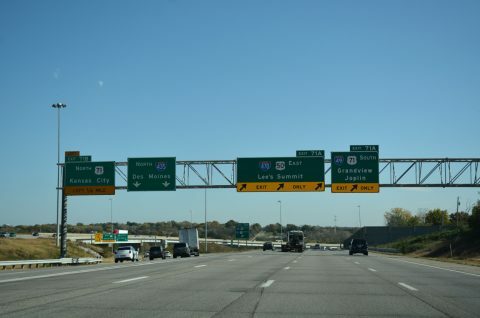 Button copy overheads posted along I-435 & U.S. 50 east from when the beltway was just six lanes wide between the Blue River and the Grandview Triangle Interchange. Photo taken by Michael Summa (1984). 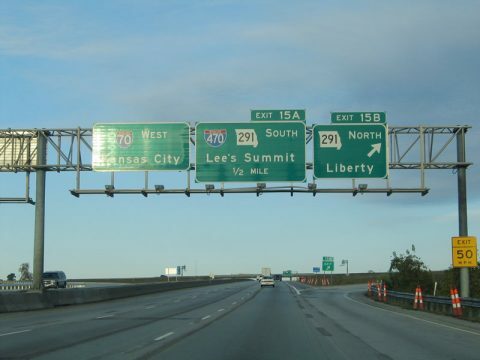 “I-470 interchange in Lee’s Summit is done.” The Kansas City Star, June 30, 2010. 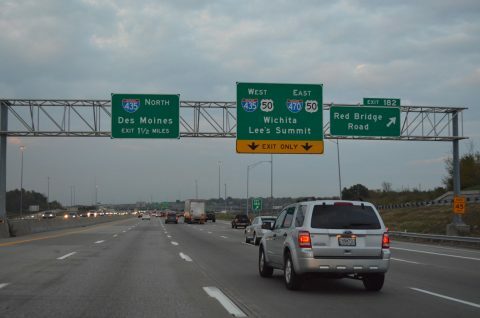 “Ceremony to open new interchange at I-470 and Strother Road in Lee’s Summit.” The Kansas City Star, August 19, 2010.